COXCO Training and Consulting offers Best Selling books by Richard A. Cox. We also offer On-Site training classes for Electrical CEUs. We can also customize a class to fit your needs. 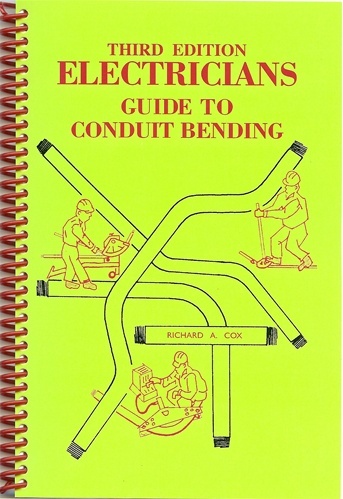 The new Third Edition of this National Best Selling book on conduit bending has been expanded by 50 pages and will show you step-by-step how to bend stubs, ninety degree bends, offsets, kicks, saddles, segment bends, concentric bends, etc. All forms of pipe bending are included; EMT, Rigid, IMC, PVC and Aluminum pipe. Hand, Mechanical, and hydraulic bending methods and equipment are covered. Included is a wallet-sized table with all the formulas and constants you need for precision bending. BUY any two (2) products and receive a FREE TRUBEND WOW Watcher as seen below. Richard A. Cox retired as the Chairman of the Electrical/Robotics Department at Spokane Community College in Spokane, Washington. He holds a Bachelor of Science degree from the University of the State of New York and a Master of Science degree from Eastern Washington University and is also a retired member of the International Brotherhood of Electrical Workers, Local 73. Copyright © 2013 COXCO Training and Consulting. All Rights Reserved. Built with Volusion.